Vladimir Tarasenko scored his 40th goal of the season, but the night of milestones belonged to the Washington Capitals. Goalie Braden Holtby tied Martin Brodeur for the NHL record for wins in a season, and Alex Ovechkin scored a hat trick to reach 50 goals for the third straight season, in the Capitals 5-1 win over the Blues at Scottrade Center on Saturday. Holtby won his 48th win in his 66th game (48-9-7), tying him with Brodeur, who was 48-23-7 with the New Jersey Devils in 2006-07. Brodeur is now the Blues assistant general manager. He was at the game. The Blues will play the Chicago Blackhawks in the Western Conference First Round; the Dallas Stars, who won the Central Division, will play the Minnesota Wild. 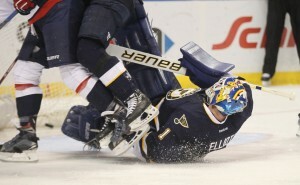 Brian Elliott made 22 saves, but his record 11-game winning streak ended. He sat the third period in favor of Anders Nilsson. The Blackhawks, the defending Stanley Cup Champions, will make the trip to St. Louis on Wednesday. The finished 47-26-9 and in third place in the Central Division. They will be led by Patrick Kane, who wrapped up the first Art Ross Trophy (to the player with the most points scored in the regular season) by an American-born player with two goals and an assist in their 5-4 loss to Columbus. Kane set NHL career-highs in goals (46), assists (60) and points (106). The Hawks also have Artemi Panarin. The rookie finished the regular season with 30 goals. Panarin and Kane are paired together. Chicago will also have their starting goalie back for the playoffs. Corey Crawford missed time with an upper body injury. He gave up five goals on 25 shots on Saturday.